That insignia style was the standard until May 1942, so it's possible (but not likely) the accident occurred during the war. Some planes might not have changed to the new standard (dropping the red ball) for several months. The glider program took a while to get started, I'm thinking that's not too likely. My thought was a Fairchild PT-19 trainer...there are photos of it in silver with the pre-war markings. I believe the wings were wood-skinned, but did they apply fabric on top of the wood? Beyond that, the Navy used the same markings. Could have been from the bottom of the lower wing of a Grumman F3F or similar ilk. [Edit] Looking at the roundel, the rib spacing is fairly close. This does argue for a faster airplane, like a fighter. With the rib stitching, probably not a PT-19. Last edited by rwanttaja; 11-05-2018 at 03:27 PM. The rib spacing should provide a clue. Thanks for the replies so far. Ron, I hadn't been thinking Navy at all for some reason, but based on your suggestion of an F3F, I think that could be a distinct possibility and might explain the owner mistaking it for more of a fighter versus a PT or something of that nature. The rib spacing was unfamiliar to me but makes perfect sense now that it has been brought up. I appreciate the inputs! I am pretty sure all of the Curtiss Hawks (prior to the P40) had fabric covered wings & they would have still been being used as trainers & such. Thanks for the input Mike. Weren't there quite a few Hawk variants? Are you referring to the early bi-plane Hawks or the monoplane P-36? I think the P-36 was an all metal construction. 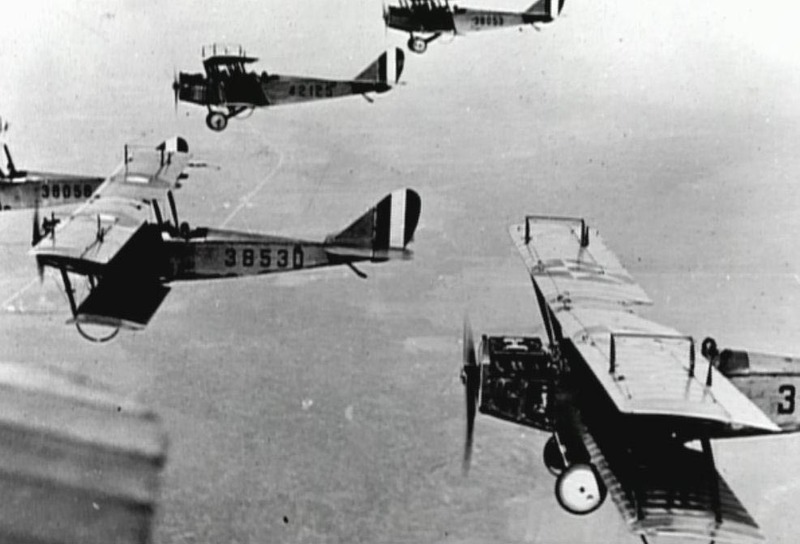 The Biplanes, I am not sure how late they were in inventory but I have seen pictures of them in the mid to late 30s with that particular roundel. IIRC, the US originally used the "star and dot" early in WWI, but switched to the red/blue/white roundel for similarity to other allied powers. Almost immediately after WWI, they went back to the star and dot. I've even heard that aircraft that stayed in the US didn't go to the roundel; no reason to. This picture was supposedly taken at March Field in 1918. Notice the mix of markings. I believe that a 36" diameter circle was standard on most planes of that era, although there were exceptions. What is most interesting and different is that when counting up from the bottom of the photo, I count 6 ribs with their stitching. But in-between the 5th and 6th rib is a diagonal rib, or some other structure. That is one clue to note, measure the distance between the ribs, and the diagonal rib. That may be a big clue for someone at a place like the Smithsonian to go on. Also the spacing of the stitches along the ribs may be a help too. Interesting artifact, thanks for showing it to us. Thanks champ driver. I think that's a great clue as well, but well outside my area of expertise. Another interesting feature or clue I think is the notch at the top. It doesn't seem like it came from removing it, but more like the roundel intersected with some other feature of the aircraft. What that would be, I have no idea.